Especiales with chorizo, beef, or chicken add $2. | With steak or shredded beef add $3. Especiales with chorizo, beef, chicken, or spinach add $2 | With steak or shredded beef add $3. Three pork tamales with ranchero salsa or chili con carne, topped with melted cheese. Corn tortilla filled with your choice of beef chicken, pork, or avocado, topped with lettuce, cheese and tomatoes. Marinated grilled pork topped with cilantro, onion and lime. Served with your choice of corn or flour tortilla, and spicy salsa verde. Topped with cilantro, onion, tomato and avocado. Choice of corn or flour tortilla. Topped with cilantro, onion and tomato. Served with a spicy mango salsa. Topped with cilantro, onion and tomato. Served with your choice of corn or flour tortilla and a spicy mango salsa. Tortilla and lime crusted Tilapia topped with cilantro, onion, tomato and lime. Served with side of chipotle salsa and your choice of corn or flour tortilla. Three corn tortillas with your choice of fillings and salsa. Topped with cheese. Fillings (Choose 3): chicken, beef, pork, spinach, cheese, beans, vegetarian beans. Salsa (Choose 1): Guajilli (roja), tomatillo (verde), Molé, chile con carne, ranchera, suiza (campana salsa & sour cream). Three corn tortillas with your choice of fillings and salsa, topped with cheese. Fillings (Choose 1): steak, shredded beef, chicken, beef, pork, spinach, cheese. Salsa (Choose 1): guajillo (roja), tomatillo (verde), molé, chile con carne, ranchera, suiza (campana salsa & sour cream). Extra large flour tortilla filled with beef, chicken or pork, then grilled & topped with ranchero salsa and melted cheese. Also available with salsa verde or chile con carne. Skirt steak and light refried beans wrapped in extra large flour tortilla and grilled. Served with rice, guacamole, sour cream, lettuce and tomato. Extra large flour tortilla filled with beans, lettuce, tomato and cheese then grilled. (Beef, Chicken or Pork) $7. (Steak, Shredded Beef or Al Pastor) $8. Breast of chicken sliced and grilled with onions, tomatoes, green peppers, poblano peppers and mushrooms. Shrimp grilled with onions, tomatoes, green peppers, poblano peppers and olives. Seasoned and grilled onions, tomato, poblano peppers, green peppers and mushrooms. Add six grilled shrimp to your fajitas $5. Grilled tomato, onion, bell peppers, poblano peppers and melted cheese all wrapped in a large flour tortilla with sour cream and guacamole on the side. For substitution with steak add $1 per item. One crispy beef taco, one beef chili relleno and one pork tamale. Succulent ribeye steak grilled then simmered in a spicy chile de arbol salsa. Served with rice, beans and guacamole. Ribeye steak seasoned and breaded, pounded very thin, served with rice, beans, guacamole and Mexican papas. Half chicken lightly fried with grilled onions, tomato and peppers. Served with rice, beans and guacamole. Grilled shrimp simmered in a spicy chile de arbol salsa. Served on a bed of rice with avocado. All Tortas are prepared with avocado, beans, sour cream, lettuce, tomato, onion and jalapeños. Seasoned and grilled onion, tomato, poblano, green peppers and mushrooms. Nutella filled mini chimichangas served with vanilla ice cream and topped with whip cream, powdered sugar. Vanilla Ice Cream. Topped with choice of chocolate, strawberry or honey, whipped cream and a cherry. Cinnamon Tequila, fresh lime juice, ginger beer and mint leaf. 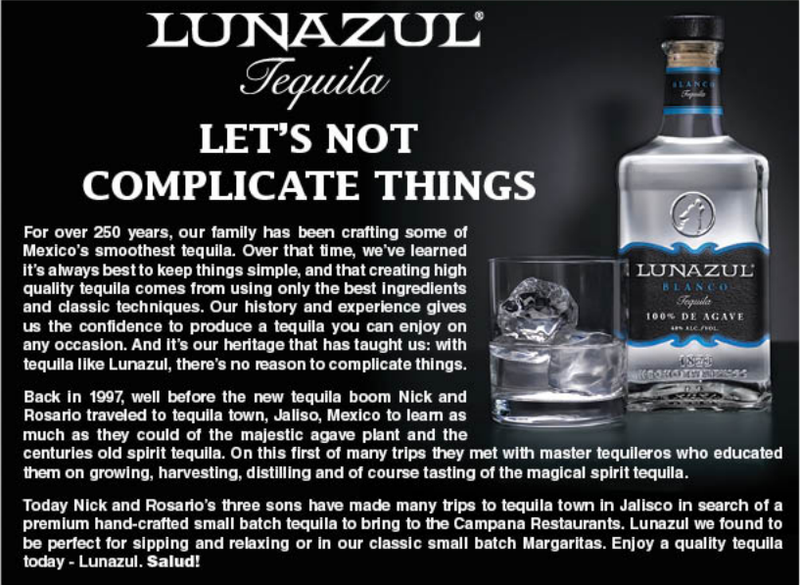 Lunazul Tequila with citrus fruits and grape fruit soda, chile, lime and salt. Served in a chilled clay pot.